Fantastic! So my beautiful card table has finally arrived at my workshop in Kinsale, county Cork. 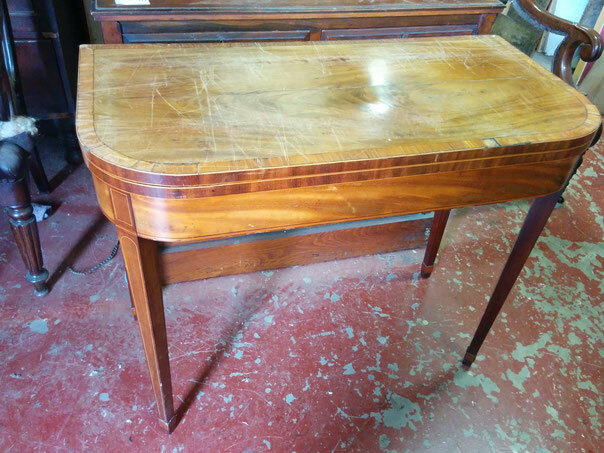 It was described as Regency mahogany and satinwood crossbanded card table at the auction I got it from. Sometimes you can see them described as George III period tables. I would date this table at around 1810. These are not very rare examples and I see them on sale quite often, but they're very nice nevertheless. People buy them mostly to use as a lovely side tables these days but if you're keen card player you could use one as intended and have your poker game with the lads in style! I bought the table at live online auction here in Ireland. I spotted it when the auction was already in progress so there was no time for condition reports, therefore I took a risk of buying it after just seeing not very good quality photo. Thankfully nobody was bidding against me so I didn't pay too much for it at the end, and I could afford to have it shipped to Cork. I expected the piece of furniture to have bits of veneer and stringing missing and that was exactly the case. I also expected the need of complete refinishing ie French polishing. Thankfully the structure of the table is sound and the back legs swing quite well to support unfolded top, considering its age of 200 years. (I won't be swinging much when I'm 200, that's for sure.) There's also a split in veneer across the top of the table. You can see those quite often on antique furniture as a result of groundwork, which most of the time is a cheaper secondary timber, splitting over the years and the veneer glued on top of it splits with it.